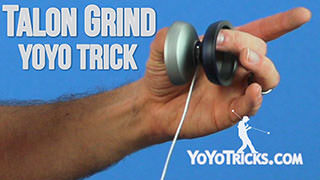 Learn to do the popular horizontal grind trick known as a Finger Spin. 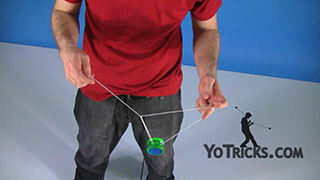 Finger Spins Yoyo TrickIn this video we are going to teach you how to do finger spins. Finger spins are a grind trick where you catch the yoyo like this in a horizontal position and we are also going to talk about yoyos that are particularly good for finger spin tricks so that when you start learning, you are equipped with the tools to learn this trick. When you first start learning finger spin tricks, the most obvious type of yoyo to get is one that is like this with a big open wide area for your finger. 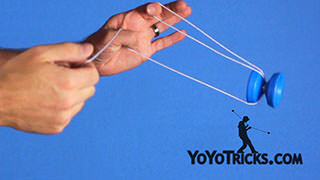 You will notice that this yoyo, which is the Transcend, has a flat surface for you to catch the yoyo. What you will notice is that when you catch this yoyo, because of that flat surface, the yoyo does not actually stay still on your finger, but your finger orbits around the outer edge of that flat surface. Now because we know that these yoyos with the flat surface do not actually keep your finger centered, but they do work for finger spins, what that also means is that yoyos like the Canon that have a spike in the center, or yoyos like the Civility that have a hub, they may actually be good for finger spins, and in the case of those two yoyos, what you will find is that they are actually great for finger spins. So even though it might be counterintuitive, just because a yoyo has something in the center of it, that does not exclude it from being a yoyo that is great for learning these tricks. 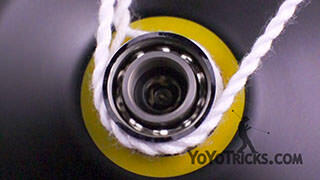 Now, that kind of begs the question, what yoyos do not work for finger spins? 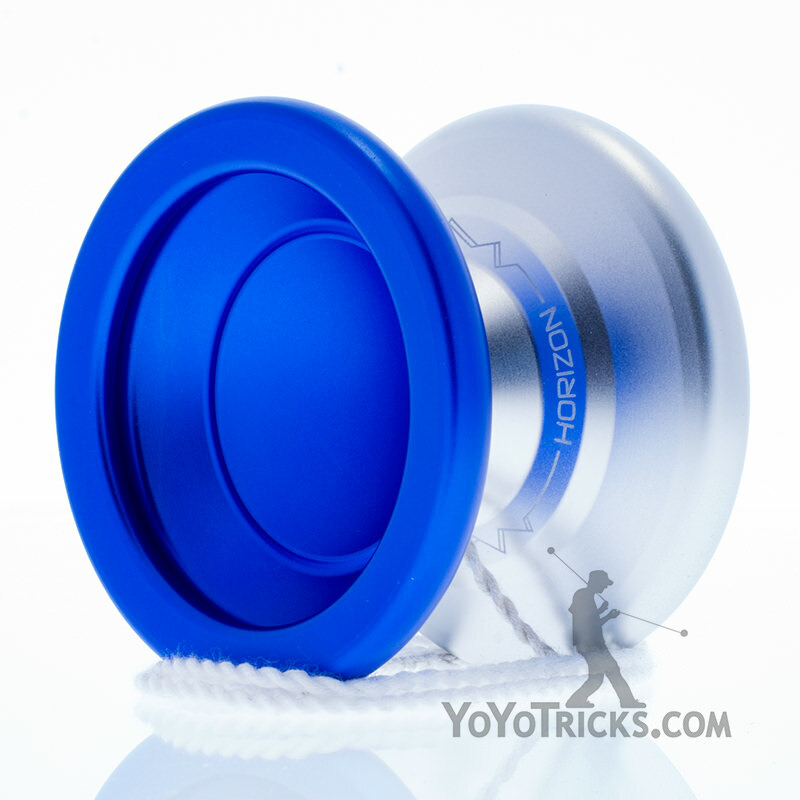 So the most obvious answer to that is yoyos with a capped design like this, there is really nowhere for your finger to sit when you are doing finger spins so those will not work. But other yoyos that have a wide open design like this, they may not work for finger spins as well, and so, in the case of the Dash, if you were to imagine where your finger would go during a finger spin, there is not actually enough room so your finger kind of gets pinched during the finger spin and there are too many points of contact. So even if you were to attempt a fingerspin, you will see that the yoyo just bounces all around and it is completely out of control and it just does not work great, so you want to avoid yoyos like that. Now, certain characteristics that make yoyos great for grinds, like being metal or bead-blasted, those also make them great for finger spins. There are a handful of plastic yoyos on the market that are designed to be ok for finger spins. So with the Replay, what you will find is that because of the shape of the cup, it does work but you can see it does not do finger spins for a really long time, so it is ok for learning the basics, but not great for more advanced tricks. Now if you want yoyos that are absolutely the best for finger spins, what you want to get is a yoyo that has design elements for finger spins. So in this case the Horizon you can see it has that bowl shape which will help keep your finger centered, or the Atlas has a dimple in the center which also helps keep your finger centered. And the reason why these shapes are good is because finger spins last a lot longer the closer your finger stays to the center of the yoyo. So if you have a finger-centering design, those yoyos are going to spin as long as possible. So let’s get to the trick. When you are first learning finger spins there are a couple of things that you may do that are actually going to make it more difficult to learn tricks, so some of these first tips are going to be more counterintuitive. 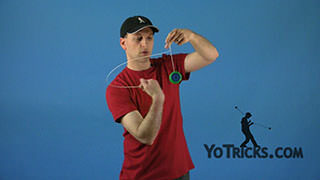 The first thing that we would recommend when learning a finger spin is that instead of throwing the yoyo across your body like you typically do for horizontal style play, we recommend that you start by throwing it in the opposite direction and in more of a frontstyle throw, again, for horizontal play. The reason for this is that is sets you up for the laceration-style bind which is the bind that most players like to learn when they are doing finger spins. 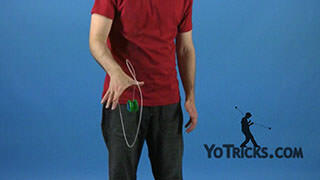 Now, another common mistake that players make when they are learning their finger spin tricks at first is instead of catching the yoyo on their opposite hand, they want to catch it on their yoyo hand, and this kind of makes sense, because that is your dominant hand, and it would seem like because you were more coordinated with that hand, you will learn the trick easier. In fact, when I have taught people, most of the time they learn the trick faster on their opposite hand, and I think it is just the way the motion of the yoyo goes, it kind of balances out that little bit of awkwardness that you will feel when using your opposite hand. There are a couple more reasons why you would want to learn with your opposite hand anyway. 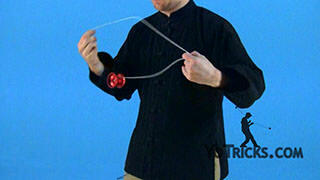 The first one is, there is no really good way to bind when you are doing a finger spin on your yoyo hand. And so, you are going to have to find other ways to get out of the trick, so it just will not look as good. The other thing is most of the best tricks that are done with finger spins involve having the yoyo on your opposite hand. So for so many different reasons, it just makes more sense to just go for it and learn it on your opposite hand. 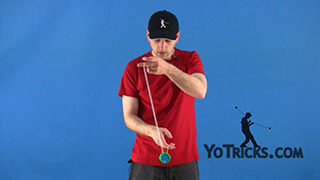 Now, a third problem that a lot of players run into when they are first learning this trick, or a third misunderstanding, is that they assume that the yoyo has to be perfectly horizontal when they first catch the yoyo. Of course you can always catch the yoyo like that and it is totally fine to do that, but it is actually quite a bit easier to learn the trick if when you throw it, you allow the yoyo to be at just a little bit of an angle and you will see that as the yoyo spins, it will start to level itself out. Now the reason that you want to do that is that no matter what shape the yoyo is or how good is it for finger spins, if you catch it at that little bit of an angle, what you will find is that the yoyo is going to be perfectly controlled, it is not going to have that thing where is moves from side to side, and that will allow you to do finger spins longer, and it makes it easier to catch them at first. So it is not a bad idea, and it is even good if you allow the yoyo to be at a slight angle when you are doing finger spin catches. 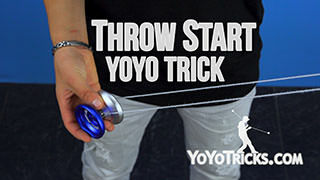 Now the last thing that I have seen a lot of players get wrong is that when they are first learning these tricks, they will get a little bit timid and so they do not throw the yoyo very hard, and that keeps them from learning the trick. You have got to remember that finger spins are a grind, and just like any grind, the yoyo slows down really quickly, and so it takes a really, really powerful throw to learn these tricks, and you have just got to have that confidence and just go for it, if you want to attempt these tricks. When you kind of put everything together, and you want to work on your first finger spin trick, what you are going to do is throw the yoyo across your body at a slight angle, and when you catch it, what you want to do is you kind of want to come down with the yoyo a little bit. The reason for that is the slower the yoyo decelerates, the more control you are going to have on your catch. So that coming down is really helpful when learning this trick. The second thing that you want to keep in mind is that when the yoyo is at an angle, if you look inside of the cup there is going to be one point that is the highest point of the cup and if you think about it, no matter where you catch it, your finger is going to drift to that highest point, so if you want to have as much control as possible on your catch, you want to get your finger to that highest point immediately when you catch it. So, you want to catch it at the highest point and come down with it, and that will give you as much control as possible on your catch. Now one thing that a lot of players think is that to get long and accurate finger spins, you need a long fingernail. This is not actually the case. 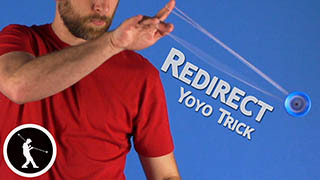 If you hold your finger like this when you catch the yoyo, you can see that even if your fingernail is really short, that the highest point is where your fingernail is, and so again that highest point is where you are going to be contacting the yoyo, and so it will still work even if your fingernail is short. Same thing if you extend your finger like this, if you put it at an angle, your nail will always be at that highest point, which will allow you to do a finger spin on your nail even when it is short. Now one other thing that will help, especially if you are using a bowl-shaped yoyo, is to use what we like to call a “soft finger.” And that is especially easy if you catch the yoyo like this and what a soft finger means is when you are holding the yoyo, you do not tense up the muscles on your finger, and if you do not do that, then what you will find is that your finger will actually start to vibrate instead of the yoyo, and when that happens, you will see that the yoyo will stop moving side to side, and your finger will vibrate instead. If you can achieve that, you can get the longest possible spin times out of bowl-shaped yoyos, and that will give your more control overall. 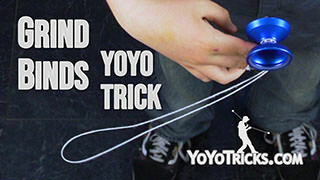 Even if you are not using a bowl shaped yoyo, it is always a good idea to have kind of a soft finger, and the reason for that is when your finger is stiff, it is going to cause more wobble in the yoyo, so with a soft finger the yoyo will just move a little bit, but as soon as you make your finger really stiff you will see this start to happen. So if you are noticing that is happening when you catch your yoyo in finger spins that is probably what the problem is, that you are just holding your finger a little too stiff. Ironically, getting a soft finger is one of the most difficult parts about learning finger spins, to get down, and so even if you understand it in your mind it is going to take a lot of practice to get it down just right. Now one of the other things that you may have noticed me doing when I am doing finger spins is that I keep my yoyo hand raised up. 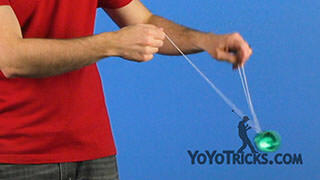 The reason that I do this is that I want to keep the string over here from touching the bottom side of the yoyo. 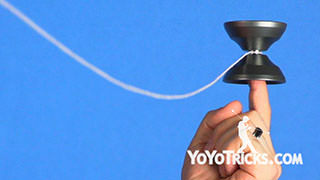 If you allow the string to touch the bottom half of the yoyo, what you are going to see is that the yoyo starts to pull the string around your finger and then this will happen. The yoyo will fall off, it will pull tight around your finger, and it can actually hurt pretty bad. So it is a good idea just to get used to the idea of keeping your arm extended, raised up a little bit to make sure that string is not going to touch the bottom half of the yoyo. So after learning all of that, you are ready to bind. 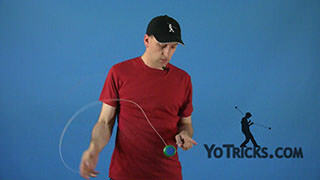 If you have been throwing the yoyo the way that we have described in this video, what that also means is that you can now do the laceration-style bind that I have been doing in the video. 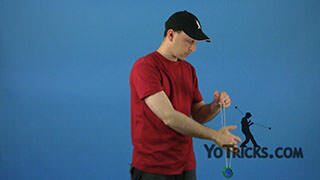 The reason why this works is because when the yoyo is spinning that way, the laceration style bind is a backspin bind, which works the best as you have learned from our bind theory video, so if you are not quite sure what I am talking about, you definitely want to check that video out. So when you are executing this bind, there are a couple of techniques that will definitely help. The first thing is that you are going to get a lot more control on the string if you pinch the string over here, so you can even pinch it with your thumb or your first finger. 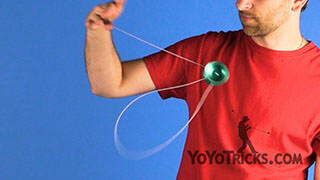 That just seems to get more action out of the string as you move it around the yoyo. 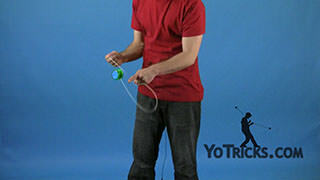 The second thing is a lot of times, especially with new players that are just figuring out their bind, they do not get quite enough action out of the string, and so they end up throwing it below the yoyo, and you can see that can cause a lot of problems. So it is just a lot easier, especially in the beginning when you are getting used to how the string moves, you can aim just a little bit above the yoyo and a lot of times you will find that the string goes right into the gap, which of course is a lot better. 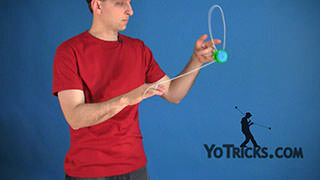 Now the third thing is that a lot of people, when they do this bind, they just want to use their wrist to get the string moving, and that does not quite work, what you do want to do is you want to move your whole hand and actually get it pretty close to the yoyo and you move it in kind of a “C” shape. You are going to pass right by the yoyo and as you do that, you are going to turn around, bring your hand kind of close to your face, and then pull away from the yoyo, and the way that works out is when the tail swings all the way around the yoyo and it has got the most contact with the bearing, that is when you end up pulling with your hand and that activates the bind. You may also notice that I have caught the yoyo with my thumb upside down. If you do that then the yoyo is going to be sitting in your hand the right way which is the just the cleanest way to do it. 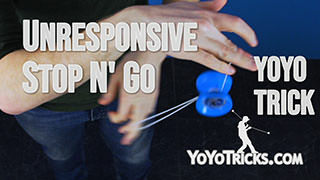 If you catch the yoyo with your hand like this, it is going to be upside down, so you will have to flip it over, so it is just a good idea to remember to do that. Now when the yoyo is spinning the opposite way, that is when you throw it across your body, this laceration-style bind is not going to work because it is no longer a backspin bind. So there is a whole different technique that you can use to get good binds with this particular throw. 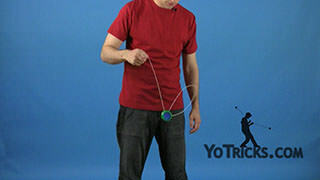 So to achieve this, the first thing you want to do is throw the string over your shoulder, and it is a little bit easier to get that to happen if you move the yoyo in towards your neck as you are swinging the string. If you do that it seems to help the string carry over, it allows both strings to land on your shoulder, if one of the strings is hanging over your shoulder then it does not always work. You also want to make sure not to raise your hand up as you do that, because then the string may end up touching the bottom half of the yoyo and then if will wrap up and you do not want that. 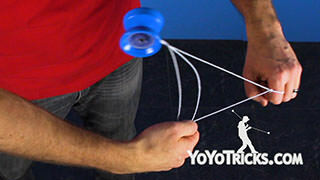 Once you have the string over your shoulder, then all you do is you feed the string in on the inside of the yoyo, and you just pull your hand to the outside and as you pull that string again it is going to be touching the bearing so it will start to pull it around the right way, which is going to activate the bind. All the different parts of finger spins, from the throw, to the catch, and especially that soft finger and even the bind, everything is pretty difficult on its own, and for a finger spin you have to put them all together in really just one moment in order to be able to hit this trick, so you really need to be patient with yourself and you need to keep working on every single aspect of the trick to be able to lay down that skill to be able to hit it the way that you want to every time. As you can see finger spins are pretty exciting tricks and it does not even matter if you are showing it to a yoyoer or a non-yoyoer, it seems that everybody really enjoys what can be done with the yoyo and is really surprised at how neat these tricks are, and so it is definitely worth the time to put in the effort and so we hope that this video helped you out, and those are finger spins.